Review by AllTheBestFights.com: 2019-01-26, tough fight with some nice exchanges: Jaime Munguia vs Takeshi Inoue gets three stars. Both undefeated, the current Wbo light-Mw champion Jaime Munguia entered this fight with a perfect record of 31-0-0 (26 KOs=84%) and he is ranked as the No.1 super welterweight in the world while his opponent, Takeshi Inoue, has an official boxing record of 13-0-1 (7 knockouts) and he entered as the No.20 in the same weight class. In their last three fights Munguia has beat Sadam Ali (Sadam Ali vs Jaime Munguia), Liam Smith (Jaime Munguia vs Liam Smith) and Brandon Cook (Jaime Munguia vs Brandon Cook) while Inoue has won over Riku Nagahama, Niwat Kongkan and Yuki Nonaka. The only man who stopped Inoue in a draw was Daishi Nagata at his professional boxing debut in 2014. 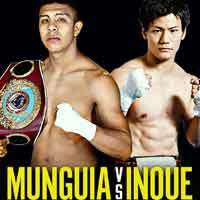 Munguia vs Inoue is valid for the WBO World super welterweight title (Munguia’s third defense). Watch the video and rate this fight!